All ranting and fear mongering aside, the LA Times piece was a great article and included some great recipes. The first one I tried was for pickled zucchini. The word â€œpickleâ€ has become synonymous with pickled cucumber, but the truth is you can pickle almost any type of vegetable. 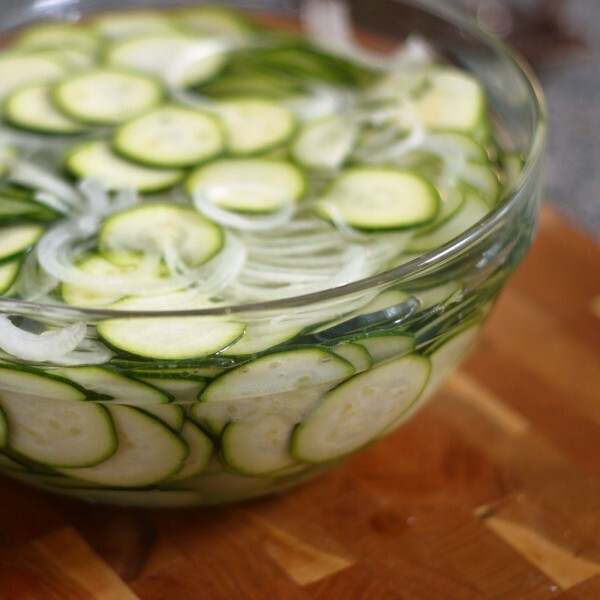 Since zucchinis are cheap and plentiful throughout the summer, they are a prime target for pickling. 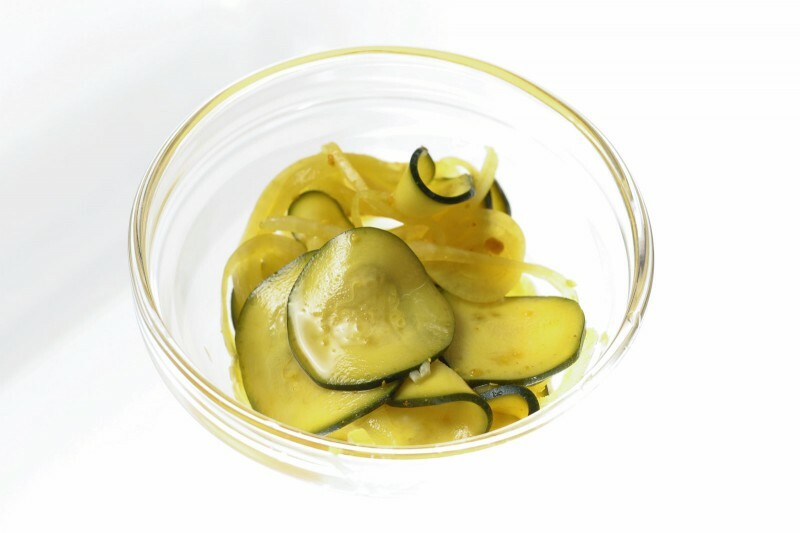 This type of pickle doesnâ€™t rely on fermentation for its acidity, like sour pickles, but rather vinegar is used to preserve and flavor the pickles. This recipe is from the great Zuni Cafe in San Francisco. I have only been there once and had a great meal, but I didnâ€™t get to try any pickles. I also found another Zuni Cafe recipe for pickles, this time for onions. Based on how well the zucchini recipe worked, I will have to give it a try. These pickles get their crispness from a soak in a chilled salt brine and their color from turmeric, which is added to the pickling liquid. Turmeric is great at coloring things, so great that you have to be careful. Store the pickles in a non-staining plastic or glass container. If you wear any color other than yellow while making these pickles, do so at your own risk. You have been warned. If give this recipe a try, however, you will be rewarded with brilliant pickles both in flavor and color. Can these be pressure cooked, and stored on the shelf, like in canning? I use a similar recipe. 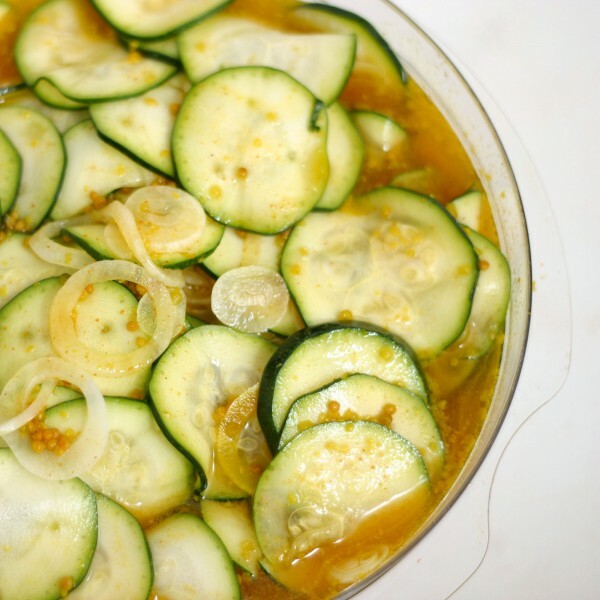 In a large bowl, layer squash, onions & peppers. Sprinkle with salt, stir, & let sit for 1 hour. Drain off excess liquid, (I rinse vegetables off so they aren’t too salty) In a large cooking pot, bring other ingredients to a boil & add vegetables. Bring back to a boil & cook for 5 minutes. Spoon into HOT jars, wipe rim, put on lids & bands & seal Tight. Allow filled jar to cool on counter or overnight. Seals will “Pop”. That lets you know they are sealed tight & can be stored for future use. Test jars by pushing on seal in the center. If the lids gives, Then, they are NOT sealed & must be eaten soon. I made some of these last summer (2011) and I still have some on the shelf! They will stay nice & crisp & crunch when you eat them! 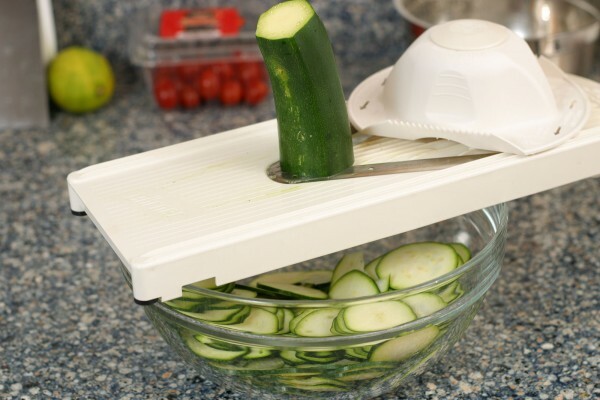 This is fantastic, I was just searching for something different to make with all my farmers market zucchini! Are these a sweet pickle? Are these simply refrigerator pickles, or can I make some and store them in a root cellar? I am assuming the difference would just be pressurizing the jars, but wasn’t sure. Thanks!!! I think it might be more to it than that. I think you also need a certain level of acidity, salt, or sugar to help prevent the growth of bacteria. 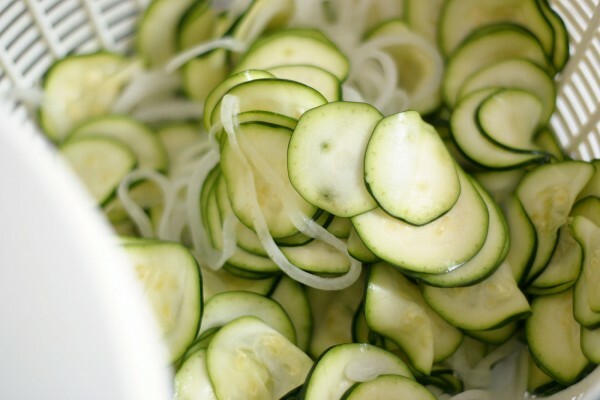 Since the zucchini never get fully cooked like a tomato sauce, there could still be bacteria hiding in them. Good question! It is a plastic container with a press to hold the vegetables in the pickling liquid. Do a quick search for Tsukemono and you should see some examples. Wow, your photos make zucchini look delicious. Do you know how long these will keep in the fridge? Dear SIR IM ASKING IF YU HAVE SOME RECEPIE FOR ZUNI SALAD IF THERE IS SOMETHING LIKE THAT. Came here via Dinner Tonight. I have got to try this, we love pickles. i knew there was some exciting way i could prepare my courgettes! cheers for this recipe and amazing pictures! I have to try this real soon. Looks yummy! Hi Maggie – That would definitely work. As long as you keep the level of salt and vinegar about the same you can add any seasoning you want. Let us know how it works! My zucchini is growing like crazy. I’m thinking of making these and adding fresh ginger as well.